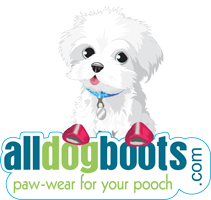 This is a detailed personal story about how I took Cooper, the Alldogboots.com mascot to visit my parents in South Florida, while we were living in Louisiana. I have never taken a dog on a plane before and I learned a lot through this experience that I would like to share with our customers. Cooper and I were anxious to visit my parents in South Florida. I was very excited to hear that Southwest is accepting small dogs, as I normally fly Southwest because they have a direct flight from New Orleans to Ft.Lauderdale. I booked a round trip ticket for myself, and reserved an under-the-seat space ($75 each way) for my 9.5 pound Morkie. I also thought it best to order the Southwest Pet Carrier they offer, since I was clueless as to what travel bag would be best. I received the Southwest Pet Carrier, put Cooper in it and became very doubtful that we would be traveling together. It's shaped as a suitcase and there was no way he could even lay in it. They were very literal with the 8" seat clearance as the bag was at most 7" high. 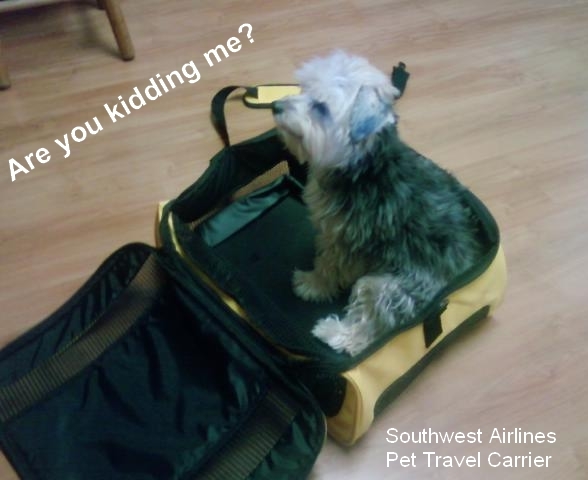 I called Southwest and they informed me that any dog must be able to turn around and stand inside their carrier. Very disappointed that Cooper could not visit family, I called my parents and brother and told them the news. I thought for a few days and realized that Cooper is under 10 pounds. How do other folks travel with their small dog on an airplane? I decided to consult twitter, and after many less than 140 character tweets, I realized that the Southwest Pet Carrier was just very misleading. 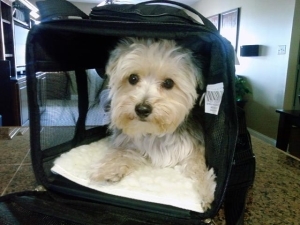 Cooper is a small dog and could travel and all I needed was a better pet travel carrier. I bought a Sherpa carrier and with lots of treats and tough love, he learned to accept it (not love it). No food. No water. Nice potty walk, but not enough that Cooper would need water. I packed his blanket and a chew bone i the carrier for him. As recommended by my veterinarian, we gave Cooper a mild sedative before the flight. The timing was tough to figure, but we gave it to him about 15 minutes before getting to the airport, as the 1/2 pill takes about 20 minutes to "kick in". I was very nervous about checking in, since Southwest said the pet needs to be able to turn around and stand in the carrier. I actually thought that meant while the pet was under the seat. We arrived at the ticket counter, I put Cooper between my legs and said "I need to check in my puppy". Cooper is not a puppy, however I thought the word puppy made him appear smaller. They did not even look at the bag! I paid his fee, they put a ticket on the carrier, and away we went to security. I wasn't sure of Cooper's condition as we were headed to security, as he still appeared extremely hyper. He was scratching the inside of the bag, but nothing that a little treat and some love couldn't handle. I was extremely nervous about security because I knew that I had to remove Cooper from the carrier. Heck, I can barely manage security by myself, usually fumbling around with my laptop and sneakers, etc. I knew enough not to take my laptop this time. I stripped down, put my personal belongings in the plastic bin and felt my heart beating a million miles a minute. Time for the dog. That crazy dog. UGH. I pulled him out of the carrier, quickly put a lead on him (in case he wanted to escape) but he held me so tightly as I put his carrier onto the conveyor belt. Together we walked through security and no alarms went off. At the other end of security belt, there were 2 airport personnel holding his case open for us so that I could easily put Cooper back in and go on with our journey. Excellent! Through security successfully. If you know anything about Southwest, you know the cattle call routine. I purposely paid an extra $10 each way to get early boarding, although it didn't seem to make much difference as I stood online with a boarding pass that read A31. We finally entered the plane and I was headed for a center seat (I was told this is the largest under-the-seat space) as close to the front as possible. Middle seat, row 5 - Perfect! After all, who else would select a middle seat? As per the advice from my new twitter friend and her very informative small dog travel blog, I took a photo of Cooper with me. Brilliant advice because the carrier is difficult to see inside, especially stowed under the seat. My seat mates both asked me what was in the carrier and I was able to quickly whip out pictures of my wild beast. They were much more comfortable knowing how adorable he is! He scratched a little, barked a little, and I think slept a little. Most of the flight he laid still and stared at me. He didn't seem too bothered, but he certainly wasn't happy. We made it! We landed, I met my father at the gate, retrieved the luggage and walked to the car. I put a leash on Cooper and let him relieve himself. We jumped in the car and headed to my parent's house. Above is my story about flying on Southwest Airlines with my dog Cooper. All experiences will be different depending on the type of dog, destination and which airline you choose. You want to go on vacation, but you do not want to leave your dog behind. You are traveling a long distance, and you do not want to drive. Flying with your pet is a viable option for some, provided it is done correctly and safely. Here are some additional tips for flying, or not flying, with your beloved four-legged family member. Dogs that are too large to fit in a carrier, tucked safely under your seat should not fly. Many veterinarians and humane organizations warn against allowing your pet to fly in an airline crate in cargo hold. Since March 2007, when official records began being kept, 17 pets were lost and 49 died during air transport. There are times when flying cannot be avoided. When this is the case, there are some safety tips to follow. Any puppy or dog that is able to fit in an airline-approved carry-on kennel should be flown alongside you in the cabin. This way, you can feed and water your dog as often as necessary. You can also be sure that the experience is a pleasant one for your animal. When booking your ticket, look for a non-stop flight. Early-morning and evening flights will ensure that the temperatures on the tarmac are not too high for any pet that is forced to fly in cargo. 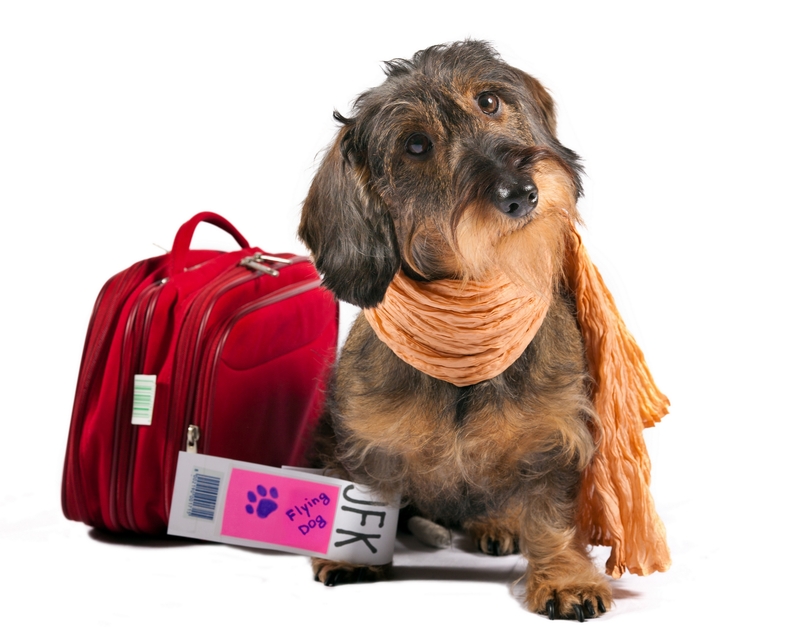 If you must book a flight with a layover, know exactly how your pet will be handled. The crate you choose should be large enough for your dog to stand up, turn around, and lay down in comfortably. Secure the corners and door of the crate with zip ties to ensure maximum safety. Zip ties are better than padlocks or other metal fasteners because they can be cut quickly in an emergency. Start preparing your pet for the flight by getting it used to its new carrier at home. Feed and water your dog in its carrier, and be sure to give it plenty of treats when it behaves in a calm manner. Try to spend at least a month getting your pet used to its new crate. Before you travel, be sure that your pet has the proper identification. Your dog should be microchipped and registered with the microchip company. Your dog’s collar should have a permanent ID tag with its home address, and a temporary ID tag with the address of your destination. Keep in mind that these identifiers are the minimum suggestion. The more identification your pet has, the better. Each airline has its own requirements when it comes to the types and size of pets permitted to fly. Check with several of the airlines that service your destination to find out their requirements. Some airlines permit larger dogs in the cabin, and some airlines will not permit certain breeds of dog aboard their planes at all. The airline representative will also be able to tell you what veterinary information will be necessary, and the representative can tell you what type of carriers are approved. Be sure that you ask about any special fees or ticket prices that you will be charged for your animal. Always find these things out months before your planned departure so that you have time to prepare. If you have the financial means to do so, a private charter may be just what you are looking for. There are several companies that offer this service, and your pet will be permitted in the cabin with you regardless of its size. If you have the budget for this type of travel, both you and your pet will be much happier during your flight. Traveling with a pet takes forethought. If you hope to ensure the safe arrival of your dog, you need to make the proper preparations. Flying with your pet can be a positive experience if you make it so.